Stephanie Rice of ‘The Voice’ joins The Dinah 2018 plus enter to win tickets! Enjoy The Dinah’s premiere social event, the star-studded Hollywood Party, featuring Jesse Reyez. To enter, email info@lesbian.com by 4pm, Tuesday, March 13, 2018. 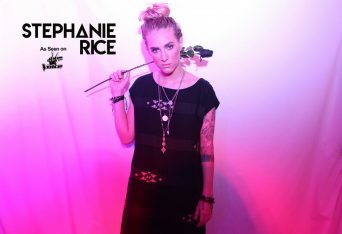 Adding to the already impressive music lineup for the 28th annual Dinah Shore Weekend, Club Skirts announces a performance from acclaimed pop-rock artist Stephanie Rice, best known for her appearance on season 12 of NBC’s The Voice. Stephanie Rice uses her music to share her powerful story of resilience through emotional, compelling performances. After coming out to her parents ten years ago, Rice found herself estranged, completely alone and unwanted. She bounced back, moved to Houston from her hometown of Texarkana, graduated with a degree in Biology at the University of Houston, and entered the professional medical field where she conducted groundbreaking research involving HIV. Throughout Stephanie’s time as a scientist, she continued aspiring to share through songs her observation of life, love and pain. In 2016, she decided to commit to music full time, completing her debut album, Dear Misery with a band she formed and fronts, Colonial Blue. The album received regional praise, including being named one of the top 12 best albums by the Houston Chronicle. Stephanie Rice will be performing Thursday, March 29 at Zelda’s Nightclub for the Official Dinah Opening Party. 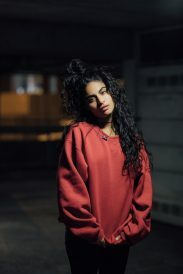 Jessie Reyez has been taking the music industry by storm since she first released her debut EP Kiddo, which was famously championed by Sir Elton John on Beats 1 Radio. The Colombian-Canadian singer/songwriter has since been on an unstoppable meteoric rise. She played the Governor’s Ball, her first New York festival and stunned audiences with a breathtaking performance of her heartbreak anthem “Figures” at the 2017 BET Awards. She appeared on Calvin Harris’ “Hard to Love”, and wrapped up a U.S. tour, which culminated back home in Toronto with a sold-out show at the Mod Club. The burgeoning singer accomplished another milestone when she made her late-night talk show debut on The Tonight Show Starring Jimmy Fallon last summer. Today, her star is still rising as she is sitting with a record deal from Island Records. A pioneer in the fight against sexual harassment, Reyez made a lot of noise when she released the eye-opening song “Gatekeeper” and companion short film of the same title: a gut-wrenching, dark and uncomfortable 12 minute piece she co-wrote with director Peter Huang, narrates, and acts in. Released last April, the song has become newly resonant, standing as a precursor of the #Metoo movement. Reyez herself embodies the meaning of “living on your own terms” and “taking charge” and continues to blaze an inspiring trail for many young aspiring female artists to follow. Jessie Reyez performs at the Sunday night Closing Party at Zelda’s Nightclub. Snow Tha Product, an MTV VMA award winning Latina lyricist and emcee with hip-hop, pop and R&B sensibilities, is exactly the rapper we need right now. The SoCal native, who records in both English and Spanish, has been involved in some pretty high-profile music collaborations, working with the likes of Ty Dolla $ign and Lin-Manuel Miranda on “Immigrants (We Get the Job Done)” from the Hamilton Mixtape. A well known artist and influencer in the social media world, the Atlantic Records artist has a legion of loyal fans awaiting her new releases. When not working on music, she’s building up her acting credits, which includes a recurring role on USA Network’s “Queen of the South” as gang leader Lil’ Traviesa. She has been recognized and respected throughout the hip-hop industry for carving her own lane. Her reputation as a spitfire performer has her nonstop energy shows selling out from the West to East Coast. Snow Tha Product hopes to one day become a role model for future generations and a voice for all Latinos. Making a whole lot of noise, Snow Tha Product is commanding the spotlight, and has everyone eagerly waiting to see what’s next at The Dinah. Catch Snow Tha Product headlining The Dinah’s TGIDF Pool Party, March 30 at the Hilton Main Pool. Hailed as one of the most acclaimed MCs in American hip-hop today, 2018 double Grammy Nominee, Rapsody, is confirmed to take center stage at Club Skirts Dinah Shore Weekend. The Snow Hill, NC native created more than a massive buzz at the close of 2017 with the release of her lyrically poetic solo album dubbed Lalia’s Wisdom. The smoldering album, in which she expertly spins out stories of love, resilience and female empowerment, features an impressive list of monster names including rap heavyweight Kendrick Lamar. From her humble beginnings as part of a rap collective dubbed Kooley High to being discovered by award-winning producer Patrick “9th Wonder” Douthit in 2008, to trading verses with Kendrick Lamar on his Grammy-nominated album To Pimp a Butterfly, to Grammy Award nominations for her solo release, Rapsody’s journey is nothing short of extraordinary. Joining a small exclusive group of artists, she had the privilege to be invited at the White House by former President Barack Obama and Herbie Hancock to perform at the International Jazz Fest. “I want to be an artist that shows women that they do have a choice to be respected off their talent alone and not because of…looks or gender. The only thing that matters is that you are dope,” says the incredibly talented trailblazing artist. She joins The Dinah 2018 line up as the perfect example of a powerful woman defining her career her way, on her terms. Catch Rapsody at The Dinah’s April 1, Sunday Funday Pool Party, held at The Hilton Hotel in downtown Palm Springs. American rapper/vocalist/internet personality Brooke Candy grew up in the greater Los Angeles area, where she developed an early love of fashion and music. Candy whizzed into Internet fame with a raw, no-nonsense delivery, a penchant for dirty talk, and a string of outlandishly stylized, provocative music videos. She is notoriously known for her cameo appearance in Grimes’ hit single “Genesis,” which gained viral success, quickly racking up millions of views, and gained her a cult following online. Inspired in part by 90’s rapper Lil’ Kim, Candy’s own musical career stands out with her uniquely blunt, irreverent sound and hyper-sexual, highly explicit songs presented in colorful videos. The provocative artist made a couple of guest appearances on Charlie XCX’s tracks including the singles “Cloud Aura” and “I Got It” featuring Cupcakke and Pablo Vittar. She released her own Opulence EP in 2014. Throughout 2016 and 2017, she released a string of singles including pop hit “Living Out Loud” featuring mentor Sia, which went to #4 on the dance charts following a remix package. The self-identified queer artist separated with her record label Sony RCA in 2017 in hopes of getting back to her punk inspired roots. Brooke has been hard at work shaping her solo career and showcasing her smooth flow and raunchy realness. Her next single is a collaboration with Lizzo, which will be followed by her second EP Who Cares, produced by MNDR, to be released in this spring on Wondersound Records. Artists like Brooke Candy are now more than ever needed. She’s effervescent, charismatic and fearless and the freedom and enthusiasm she expresses is beyond contagious… she leaves you wanting more; it’s electrifying and undeniably best experienced live! Brooke Candy will headline The Dinah’s Saturday Wet & Wild Pool Party at The Hilton Hotel in downtown Palm Springs. Kiran Gandhi, known by her stage name as Madame Gandhi, is the voice of a new generation. “I want music to make feminism culturally relevant. I want my music to make gender equality culturally even more relevant,” says the young artist. A champion of sisterhood and female empowerment, Madame Gandhi practices what she preaches. The musician and activist based in LA gained international recognition as the iconic free-bleeding runner at the 2015 London Marathon. Her choice caused a media frenzy, sparking a global viral conversation about how we treat menstruation in various cultures, combating period stigma around the world. Gandhi grew up between New York City and Bombay, India, playing drums and attending The Chapin School. She currently holds degrees from Georgetown (Math, Political Science, Women’s Studies) and an MBA from Harvard Business School. While attending Georgetown, she also immersed herself in the vibrant DC music scene, once playing Bonnaroo as the drummer for the famed Thievery Corporation. Between 2011 and 2013, she worked at Interscope Records as their first ever digital analyst, studying patterns in Spotify and YouTube consumption behavior. In 2013, Gandhi linked up with Grammy-nominated artist M.I.A. and began touring internationally with her as her drummer. She now continues to travel to perform and speak about modern gender equality, and is also working on her full-length album. Madame Gandhi headlines The Dinah’s Friday night Pink Party at the Palm Springs Convention Center. Ariana and the Rose writes, sings, and performs a coming-of-age story, one that resonates with current music lovers who seek communities where they can totally be themselves. Think a cosmic fusion of Kate Bush and Robyn: strong women of synth-pop and alternative rock, grandiose but grounded. Her honest synth driven songs have accumulated over 3.5 million streams and her vivid and experiential music videos have amassed over 2 million views. Ariana kicks off 2018 featuring on Feenixpawl & Harley Knox single “Bones” that will no doubt stake its claim as one of 2018’s most infectious pop-dance crossover anthems. While touring across the UK and the US supporting and sharing stages with artists such as Cyndi Lauper, Peaches, Jack Garratt, and Allie X, and performing at festivals including The Great Escape and SXSW, Ariana has been working on music and a show that truly represents herself. Her unique brand of performance that transcends the traditional boundaries of a concert is truly showcased in Ariana and the Rose’s immersive live music party ‘’light + space,’’ a galactic multi-sensory disco. Nylon Mag captured Ariana’s galactic grandiosity when they said, “Pop culture craved a technicolored synth pop powerhouse in the making, and Ariana and the Rose dropped in from her special place in the cosmos to quench it.” Her purpose is clear: step into her starry universe, and leave your inhibitions at the door. Ariana and the Rose perform Saturday’s Wet & Wild pool party at the Hilton Main Pool. Posted March 8th, 2018 & filed under Entertainment.